I am trying to find out the names of the A.S.L.E.F. Branch Secretaries for the Bognor Branch and the dates they served between. if you have any info please can you let me know. Neal Cowdrey as found out the following information regarding James Alfred Funnell. According the LB&SCR staff records with a J.A. 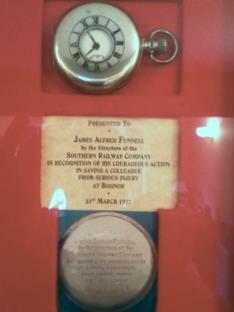 Funnell, but no reason for the award. Looks like he was born 12/12/1905 (his date of birth was 12/10/1905), and possibly entered service as a cleaner at Bognor, pay rises as a cleaner on birthdays in 1923 and 1925., and at Littlehampton in 1925. 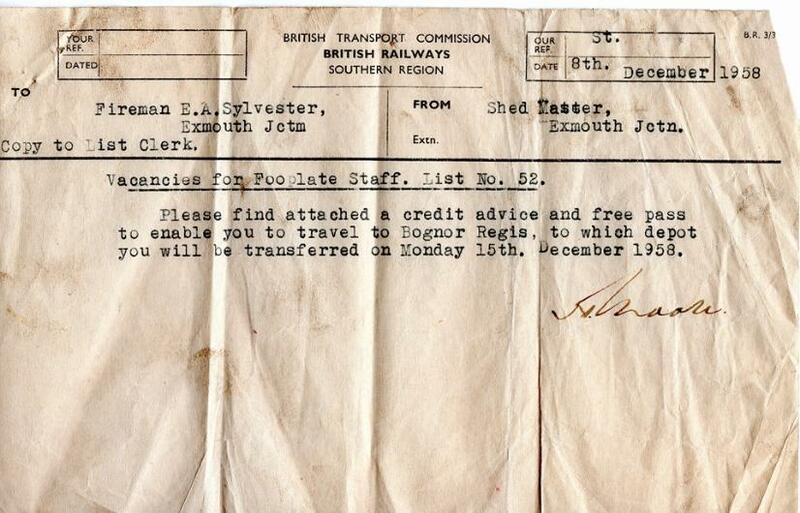 On Jan 30 1928 there is a J. Funnell transferred from Bognor to Tunbridge Wells as a shed labourer. There is no date of birth or pay number to tie this one to J.A. Funnell, but it is a possibility. The records appear to be mainly related to changes to rates of pay and not neccassarily promotion (or demotion). I have scanned through the pages from 1925 to the middle of 1927 and can't find the transfer to Littlehampton, or any transfer back to Bognor. I have no other sources that indicate an incident at Bognor. By the mid-1930s he had left the railway, and was driving the steam roller for Bognor Council. 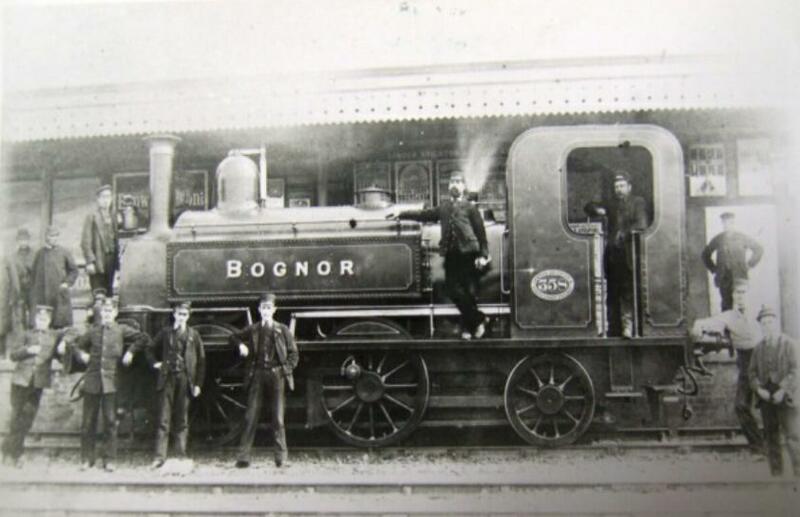 Bognor Regis’s locomotive shed was opened on the 1st June 1864 by the L.B.S.C.R. (Shed Code Bog). 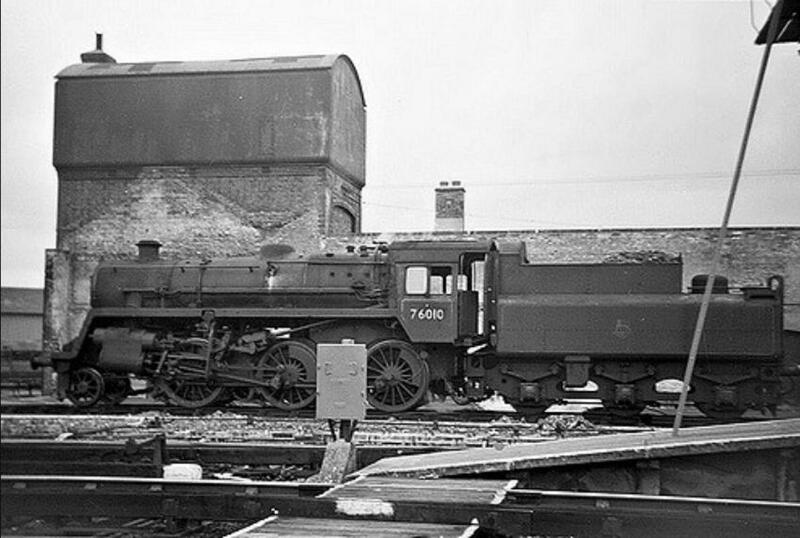 The locomotive shed (75Ds) closed on 8th November 1962. 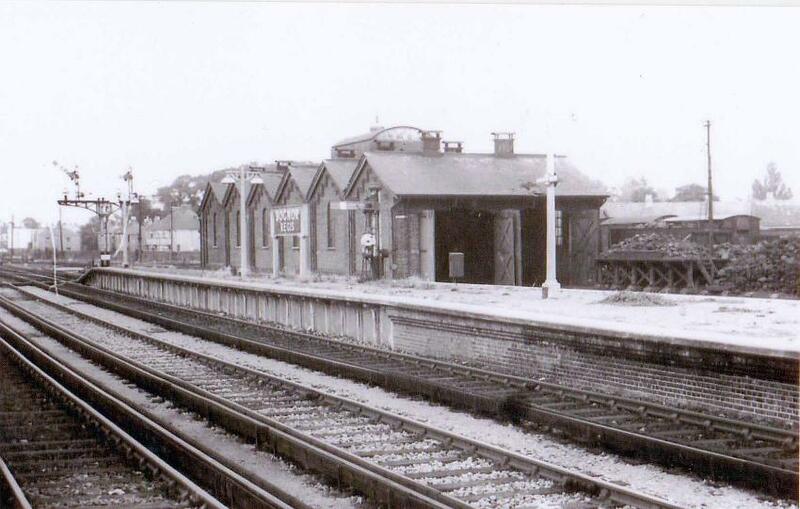 With the electrification arriving in Bognor Regis on 22nd May 1938, this created a new motorman’s depot at Bognor Regis (E.M.U.T.) which opened in 1938. In 1995 Bognor Regis Depot closed and the drivers transferred to the newly opened Barnham depot. Bognor A.S.L.E.F. members had not formed their own Branch until some time after 1912. In June 1912, they were still part of the Horsham Branch. The Bognor Regis Branch of ASLEF was opened in pre 1925 and closed in 1995. 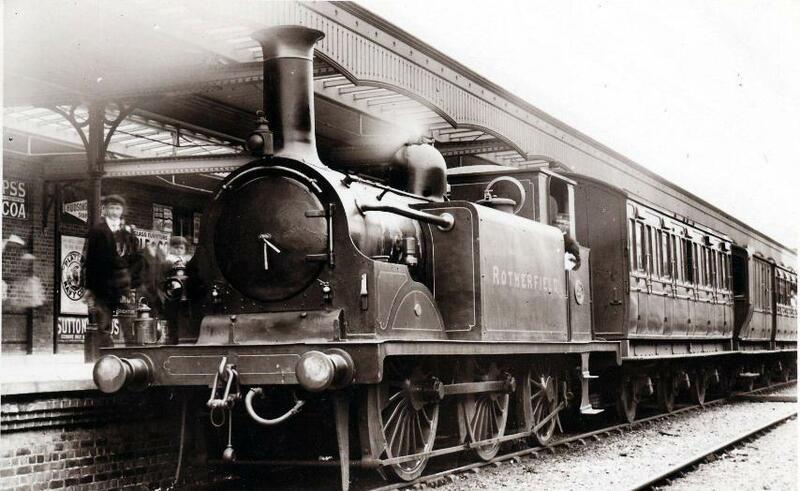 It is thought that the Branch was opened after the formation of the Motorman's depot at Bognor Regis. 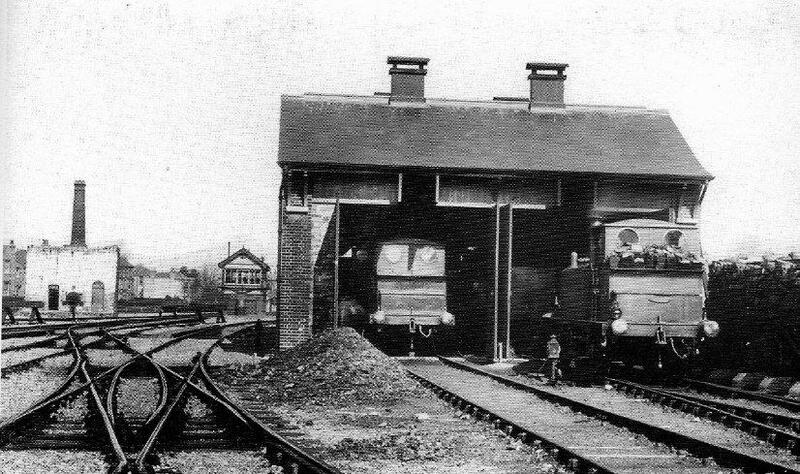 Bognor Regis second Loco Shed 1903 ~ 1953. 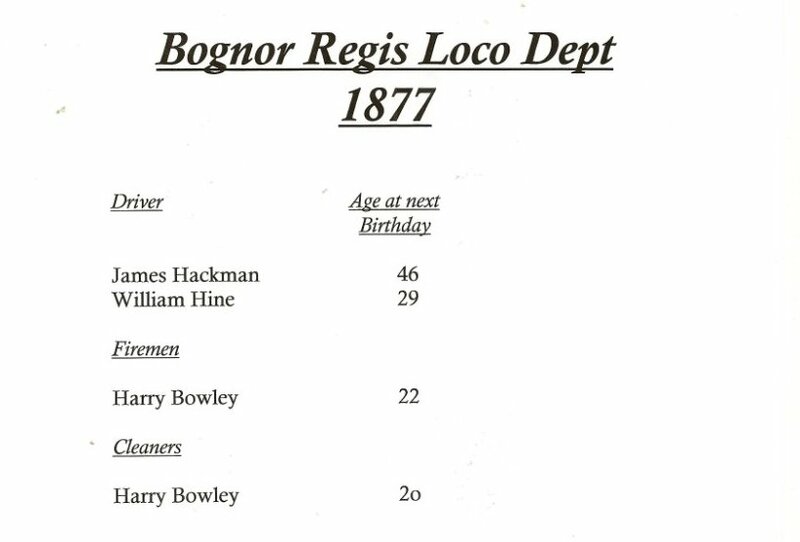 Above is a list of all the engine men that where employed at Bognor Locomotive Department in 1877. It is not know if this is list was compiled in seniority order or not. 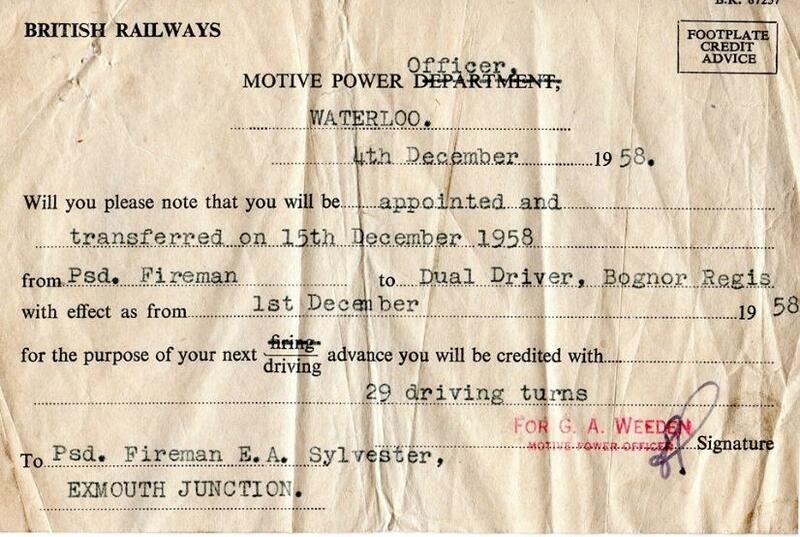 However, the list does clearly indicates the difference in the ages of both drivers & fireman at that period of time. 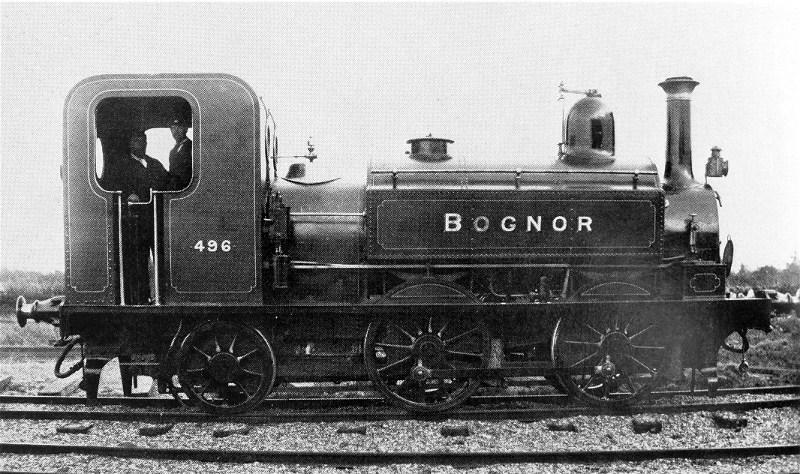 The Bognor branch engine, a “Terrier” tank, was washed out regularly every Monday, the spare engine (another “Terrier”) being used only on such occasions. The latter was generally a run-down specimen waiting it turn for general repairs in the shops. On other days it reposed behind closed doors in the combined running shed and pumping station, the site of which is now in the centre of the main tracks, approximately half-way between the end of the platforms and the Bersted level crossing. Its isolation rendered a clandestine visit a matter of some difficulty, but a persistent oral tradition records that marathon one enthusiast awaited in ambush the hour (about midday) when the pump-man) adjourned to a certain establishment in the immediate vicinity (to wit, the “Richmond Arms”) to enter the well guarded area and behold the rara avis ensconced therein. As the write confesses to having acted similarly at Midhurst in 1901, he is prepared to accept the Bognor tradition as possessing at least, some foundation in fact. The clearer worked, of course, at nights. 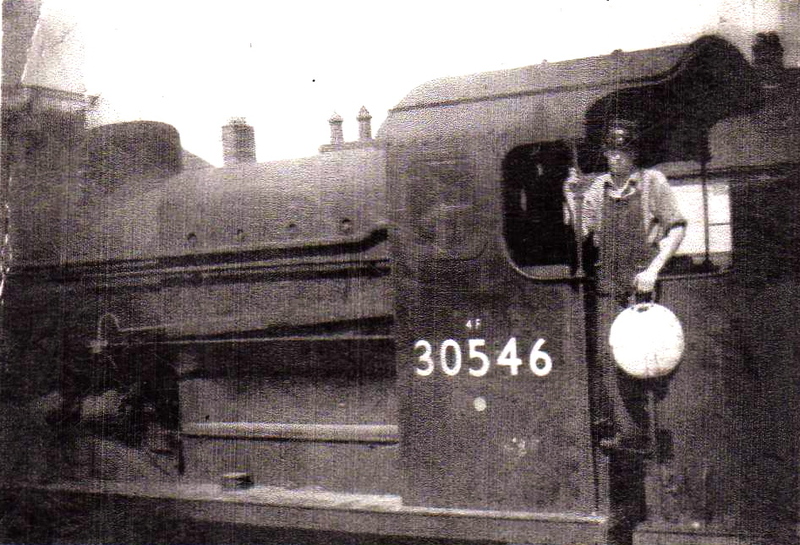 He had to coal and light up the engine, as well as clean it, for the next day’s work, which commenced with a light run to Barnham to “bring in the goods” from that station at about 6.30 a.m. The last trip out and back left Bognor about 9.40 p.m., to connect with coastal services, after which the branch closed for the night. The shed was in charge of a driver who worked early and late shift alternatively, but performed only about 7 1/2 hours as a driver, the balance of 2 1/2 hours being supposed to be devoted to administrative duties. The latter mainly consisted in sending up to Horsham the drivers’ journals (total two) the records of the daily coal and oil issues (about 30 c.w.t. and 4 pints respectively) and some other particulars of like character, all of which could easily be discharged in about 20 minutes. 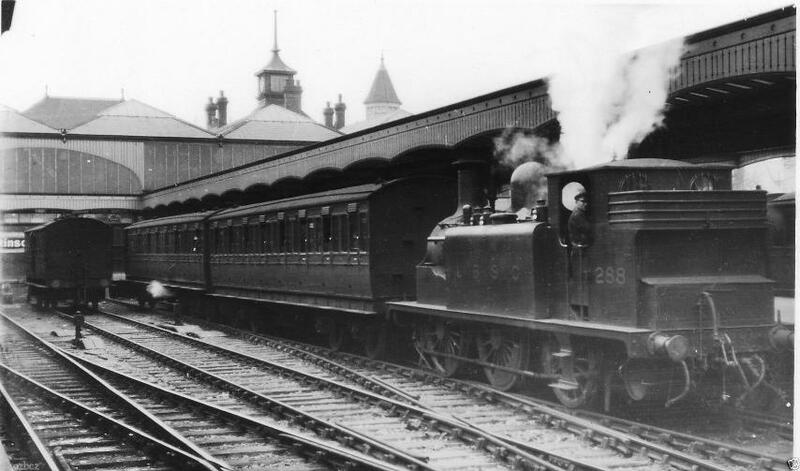 Of the three depots, Bognor was the most primitive and the most isolated, as there was no facing connection with the main line at Barnham. The branch line was single, worked on the staff and ticket principle, the tickets only coming into use on occasions in the summer when excursions mainly school treats arrived from a distance. These trains had, of course, to shunt on and off the branch at Barnham. 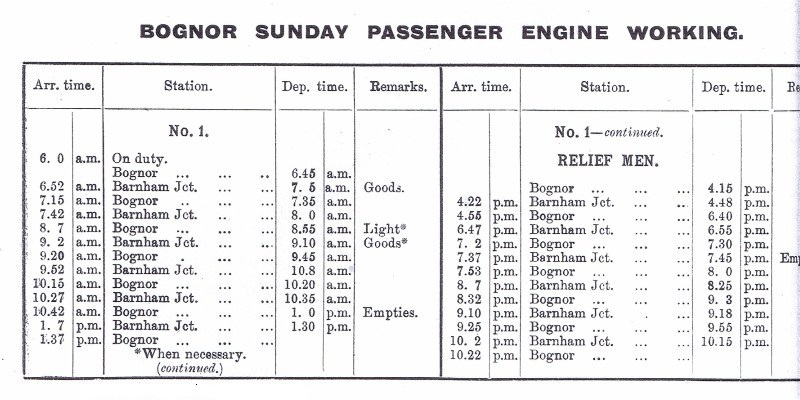 The enginemen and guards booked off and on again for the return journey, unless there was any major defect on the engine, in which case it had to worked light to Brighton to obtain another for the up trip. Strange to say, this procedure was of the rarest occurrence. 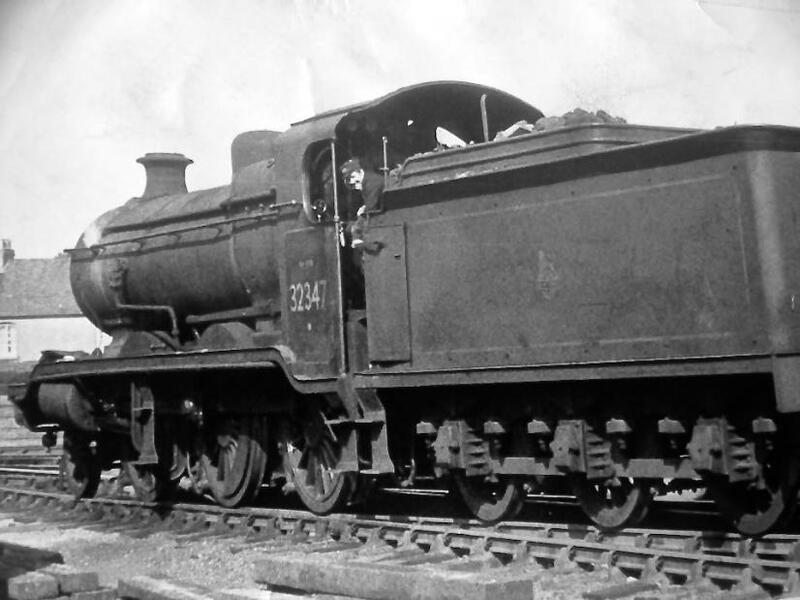 It is not recorded what happened if a Stroudley “Single” or a Class “B2” 4-4-0 showed signs of shortage of water in the boiler, but it is to be presumed that the pump-man “made the necessary arrangements” as there was no one else to do so. 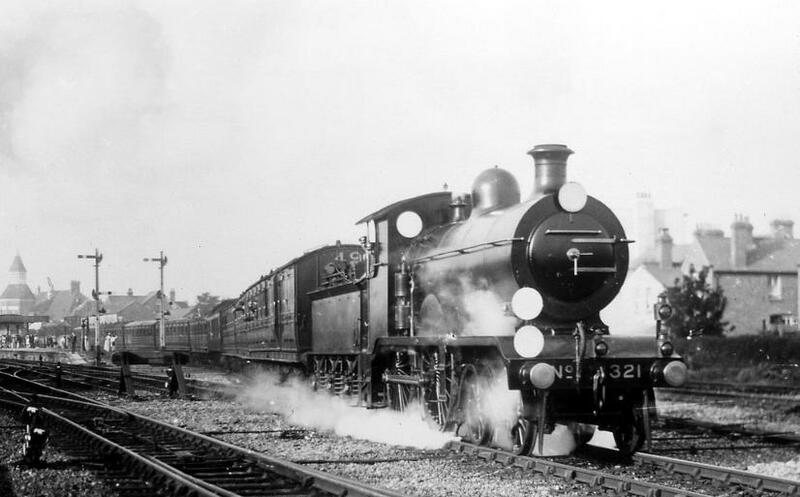 The replacement of the “Terrier” tanks by “D” Class 0-4-2s tanks on the regular Bognor branch line duties, however, a “Terrier” continued to beheld occasionally for working that branch and to be held as a spare engine until 1919. 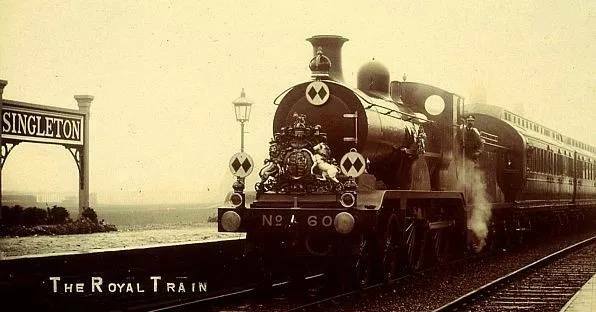 It was used occasionally for working that brach , and on the Littlehampton branch, when the necessity arose. It looks as if we shall require larger accommodation for our branch meetings. At our meeting on Sunday, November 29th, the spacious room which we at present possess was crowded out with enthusiastic members, at this depot we are 100 per cent. strong, and the only one or two waverers there are at our neighbouring depot have at last decided, I think, to pay into the finest society regarding locomen’s interest. I am glad to see that the cleaners are waking up and putting their grievances through the proper channels. I hope others will do likewise, and not sit and wait for their fellow-members to do the fighting for them. The way to gain satisfaction is to attend their branch meetings and have their say. In conclusion, I wish everybody a Happy New Year, and our Society a most prosperous one. On March 28th a bumper meeting was held here, when a room was filled with enthusiastic members. I may say that every meeting held at Bognor is packed out, and I venture to challenge any branch that could prove better attendance at meetings. The branch is 100 per cent. strong, with 90 per cent. average attendance at meetings. We are looking forward to the day when the Society is 100 per cent. strong. We are not very large here, but as firm as a rock. The 28th will be long remembered by members, as we had the honour of having of her Ladyship, The Countess de Rivas, an honorary member of the Portsmouth branch, paying us a visit, who kindly made the presentation to one of our staunch old members, Thomas Woolnough, who has been 35 years a hard-working member of our Society, of a clock, and an artistic piece of work executed by one of our members, Fireman A. May, in the shape of an illuminated emblem and address, given by the branch in appreciation of our old g able to friend’s long membership. The presentation was very pleasing to us all, and Bro. W. Porter moved a vote of thanks to her Ladyship for kindly making the presentation, also to the clever artist in our midst, who must have spent hours on the wonderful piece of art. Her ladyship expressed her pleasure in being able to perform the ceremony, and gave some very appropriate remarks to our old friend, Thomas Woolnough, and to the meeting on the value of Trade Unionism. We also had the pleasure of Bro G. Godsell, of Battersea, who gave us a few words, and urged the younger blood to wake up. He also was heartily received and thanked, and so an excellent meeting came to a conclusion. I hope to read in future of other branches who can boast of such meetings as we get. To enter into 1931, I must first of all express my appreciation of the apparent confidence shown in me again by electing me as your secretary, and I take this opportunity of thanking one and all, and trust there will be no cause for you to regret your choice. It is also well worth mentioning, that with the exception of one mot desiring re-election, all other 1930 officers were returned unanimously. That in itself, I think, expresses a great deal. I would also congratulate the members upon the way contributions were paid and several cases of arrears wiped off. These in some cases, be it noted, before the Companies’ proposal were known. Judging from the present situation, I don’t think the arrears for December will be much to talk about. Whilst broaching the subject of the companies’ suggestions that are staring us in the face, I am relying upon this branch to respond to the “Stand to Arms” call, should it be necessary to sound same. We, of course, are aware that our two slugs are awaiting the opportunity to still further deprive us of a decent standard of living. It is pleasing to note that our E.C. have taken the time is not far distant when wedge will be driven completely home. It is beyond understanding why men who call themselves “Trade Unionists” can find time to associate with such scum. Furthermore, to listen to them and be influenced by what they say gets me groggy. Dirty, low-down, sneak thieves, and yet some of you are afraid to treat them in the manner they should be treated-sooner go and treat them to half-a-pint of beer. So would I? Still, it doesn’t seem to have much effect, it doesn’t seem to have much effect. I’ve talked till I’m very nearly sick with talking, so I only hope the day isn’t very far distant when others methods will deal with them. In conclusion, I would again remind certain members that our branch meetings are still held at the Terminus Hotel, Bognor Regis and the Labour Hall Littlehampton. With fond hoped that the New Year will be much brighter than present outlook affirms. February 8th marked the occassion of a very pleasant function, by the presentation of a nice chimney clock inscribed, to the Host and Hostess of our branch-room. We had the pleasure of a visit from our Organizer, Bro. Barton Wild, to perform this little ceremony, and naturally enough it was carried out in his usual manner. It may, perhaps, strike some readers as a being a little out of the ordinary making presentations to hotel proprietors, so I would point out that the greatest consideration and kindness has always been extended to us and not a penny in rent will be accepted. I think I am right in saying that a good many railwaymen other than our locals know “Old Jim.” Bro. Wild remarked that this was about the most unique presentation that he had made some hundreds. Firstly, he thanked these good people for their kindness to this branch, and drew attention to the fact that had it not been for the like of such in days gone by many a branch would have been stranded for a meeting-room, as they invariably came to rest at some hotel or other, but he could not recollect another case of the landlord refusing to take any rent. I must also point out that in lieu of the rent allowed by Head Office for branch-rooms, they kindly headed the list with that amount. Bro. Wild, following the presentation, addressed the meeting on the current situation on the railways. Although the majority of us have been following the reports very closely, we could not help but be amazed at the figures that Bro. Wild quoted and what they actually meant when placed before us in such a lucid manner. It certainly leaves no doubt in our minds as to what action we shall take should the companies’ proposals, or anything like them, be the final decision of the N. W. B. In view of the information imparted to us, there must be no thought of a reduction, but rather must we continue to press our claims to the fullest extent. I cannot but think of the effrontery of the companies to have come forward with demands in face of figures, which are their own, as placed and explained before us. I would here suggest to all branches that have not yet had someone down to put the matter in front of them as we have, to do so at the earliest opportunity, and if there is anybody with weak knees afterwards, well they are not worth their salt. This meeting unanimously rerecorded their decision to stand by any action that our E.C. may determine upon. Bro. Wild, of course, touched upon the “Slugs” as we familiarly know them now, and strangely enough, his remarks coincided very nicely with my version in a recent Journal. I was surprised to hear that a certain amount of annoyance was caused these reptiles following those remarks. I say I am surprised, although somewhat gratified, for I did not imagine that anything could penetrate their thick skins, other than the loss of the 50 per cent. Remarkable how they are always the first to be aggrieved when they don’t get everything that we have fought and paid for. I am still longing for the time when they won’t be entitled to it. I wonder when the companies will emerge from their trance, and realize the economies they could effect on the articles? Anyway, we are getting off the road a bit. To revert back to our evening, Bro. Wild concluded his remarks and replied to questions, and the meeting closed with a drink from our host and hostess, who joined us and toasted “Our Health,” which was very heartily reciprocated. Here we are again, not yet extinct, nor likely to be whilst our few live wires keep buzzing. Before commencing the offensive, I express, on behalf of our branch, the deepest sympathy to our Bro. bill Childs in his irreplaceable loss by the death, at so early an age, of his wife. Hi remarkably well know along the old Brighton section for a cheery disposition, taking troubles, to all appearance, very lightly, and I have no doubt that he has the sympathy of many of our comrades up and down the system. The next item of interest will be the retiring of our branch chairman, Bro. tom Woolnough. Other than mentioning that he has qualified for the A.A.D. Award, I do not intend to say a lot at the moment. It may perhaps be of interest to some of the younger fraternity to know that since January 4th, 1891, has Tom been a member of the Associated. Just over 40 years, and I’ll warrant that his contribution was paid when he hadn’t much more than 18 bob to take home. Just think of it, some of you that have been picking up £3 and 18 bob for the last ten to twelve weeks and then have to be chased for a paltry 7/7. Instead of begrudging it you ought to advocate for an increase, and give our leaders a little encouragement. It’s only the likes of you and the “slugs” that we have to thank for our present reduction. I have noticed in the past the individuals who are first at the strike pay table are the last to come forward with their contributions. I am going to say here, and now, that there is absolutely no excuse for any of my so-called members to be a farthing in arrears after this summer’s work, and I further defy any one of you to dispute it, for if you can’t afford it now I don’t know how I can expect it in the winter. 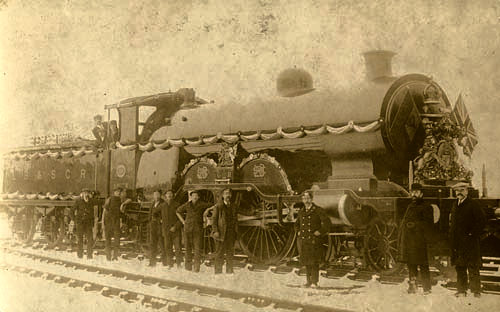 I am pleased to notice, however, that the majority of locomen at other depots are beginning to realize the necessity of joining an organization, preferably the A.S.L.E. & F. There doesn’t seem to be much doubt about the fact that we shall be up against the biggest proposition of our career in a few months’ time, and if we are at sixes and sevens, well, we may as well give up the ghost. Now, some of you young chaps, just you put your thinking caps on, and let us be able to include you under the old flag when the call comes. For the present I will retire, not being in a sufficiently fiery frame of mind, but look out for me in December. Fraternal greetings to those branches who read and endorsed some remarks of mine a while back. The pleasurable side now enters. At 7-45 p.m. the stage was set for the testimonial to our old comrade, tom Woolnough, and lo! And behold, the audience is quite large. Bro. J. Galyer, from Brighton, opened the proceedings, and in well-chosen words gave a brief outline of the object of this gathering, and called upon myself for a few remarks, and our loco foreman, Mr. Maitland, who paid a tribute to Bro. Woolnough’s remarkable career, unmarred as it was by mishap of any description. I have not the slightest compunction in saying that those remarks were unostentatiously made and were highly appreciated and reciprocated, intermitted as they were with usual compatible humour. Our general secretary was then called upon, and touched upon bro. Woolnough’s career, together with his fine trade union record - 41 years a member of A.S.L.E. & F., and still in the harness as branch chairman. Reminiscences of the “good old days” were highly appreciated and enjoyed. In handing Bro. Woolnough the presentation from his colleagues, consisting of a gold Albert, attached to which was the chairman’s gold medal, and a sum of £8 18s., he appreciated the fact that these ceremonies were getting much more frequent, and was pleased beyond measure at the feeling of comradeship. In presenting a brooch for Mrs Woolnough, our action was highly commended, for never should the lassies be forgotten on these occasions for right through the railwayman’s career the woman is a sufferer. Bro. Woolnough was then accorded musical honours. His rely, I need hardly say, was brief, but nevertheless full of meaning. Following, another pleasing ceremony was performed by Mr. Browing, organizing secretary of the N.U.R., by the presentation to Porter A. Putman and Mrs. Putman of a freshwater fishing outfit and an umbrella, together with a sum of money. After according a vote of thanks to Bro. Galyer for taking the chair, and Messrs, Bromley and Browing, a very pleasant evening came to a conclusion. Tony started at Horsham as a Engine Cleaner on the 20th January 1957 and was promoted to Fireman on the 8th February 1960 and later transferring to Bognor on the 19th September 1960. 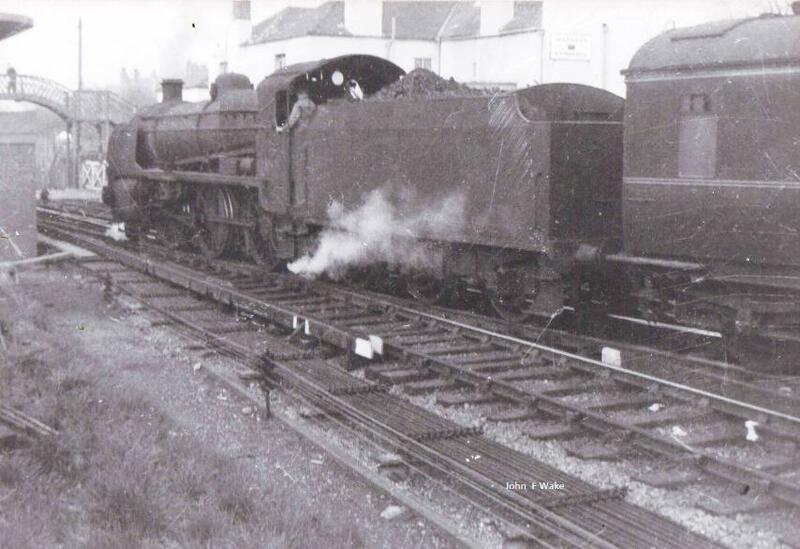 With the closure of Bognor Loco, Tony transferred to Brighton Loco on the 9th November 1962, and later moving back to Horsham Loco on 17th December 1962. With the closure of Horsham Loco in June 1964, Tony transferred to Three Bridges Loco on the 15th June 1964. 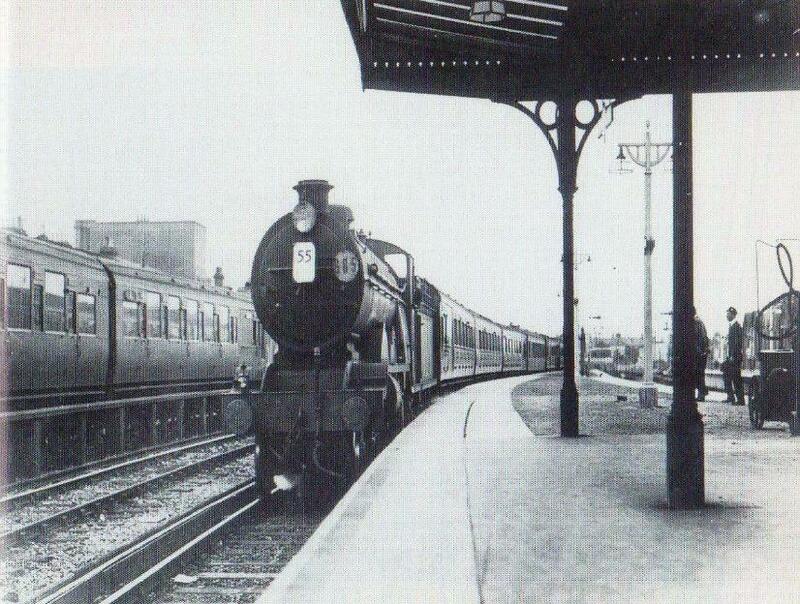 Tony's final move was on the 2nd November 1964 moving to Epsom E.M.U.T. 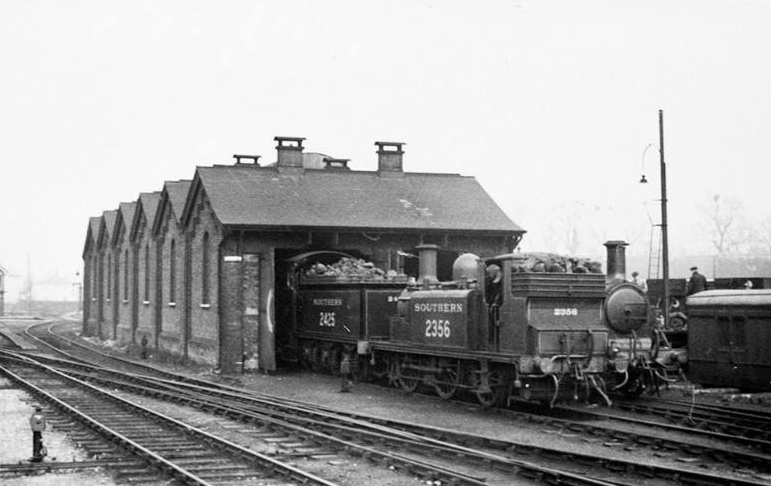 Depot for his driver's job, and later leaving the railway on the 17th July 1965. In November 1974, rejoined the railway at Littlehamton, in the traffic department and worked his way through the traffic grades and retiring as a Guard at Barnham. Two firemen Graham White and George Howes who were formerly of Bognor Locomotive Shed. Graham and George both joined within months of each other in the early 1940. 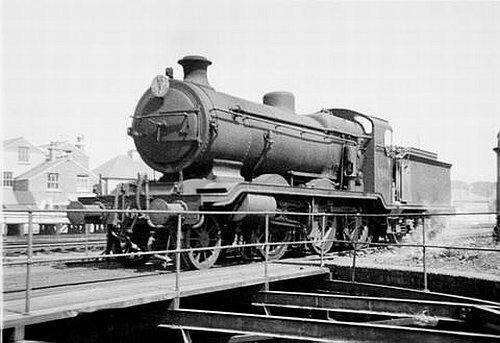 At this time Bognor was still a sizable engine shed under the rule of the Running Loco Foreman, a Jack Tribe, whose characteristics including a large moustache and a penchant for smoking a vile herbal tobacco. 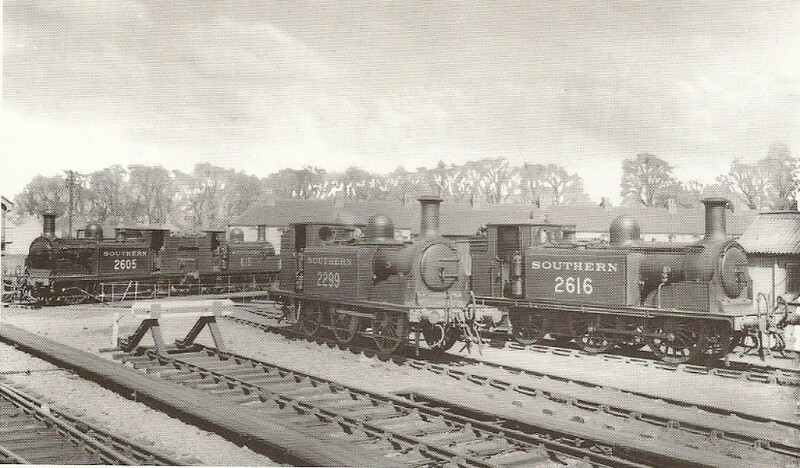 Twenty – two sets of men worked from Bognor shed which provided motive power for goods trains, including the Chichester to Midhurst goods turn. Both men started as engine cleaners but a shortage of manpower meant that spare fireman were allocated to a firing duty as required, and the following day reverted to engine cleaning duties. The cleaning shifts were 6 a.m. to 2 p.m. and 2 p.m. to 10 p.m. Even though Graham and George had fired engines on the line they were not allowed into the Driver’s and Firemen’s’ Lobby. To again admittance, a cleaner had to become a Passed Fireman. That was achieved once he had completed the requisite number of 313 firing duties. In the meantime, to emphasise their exclusion, a detonator was dropped down the chimney of the Lobby and loud explosion ensued! The requirement for a Passed Cleaner to complete 313 firing turns to qualify as a Passed Fireman had remained the same since the days of the L.B.S.C.R. Before 1923 it could take several years to notch up the required turns. There was no shortage of manpower and young men remained cleaners for years before firing an engine on the line. 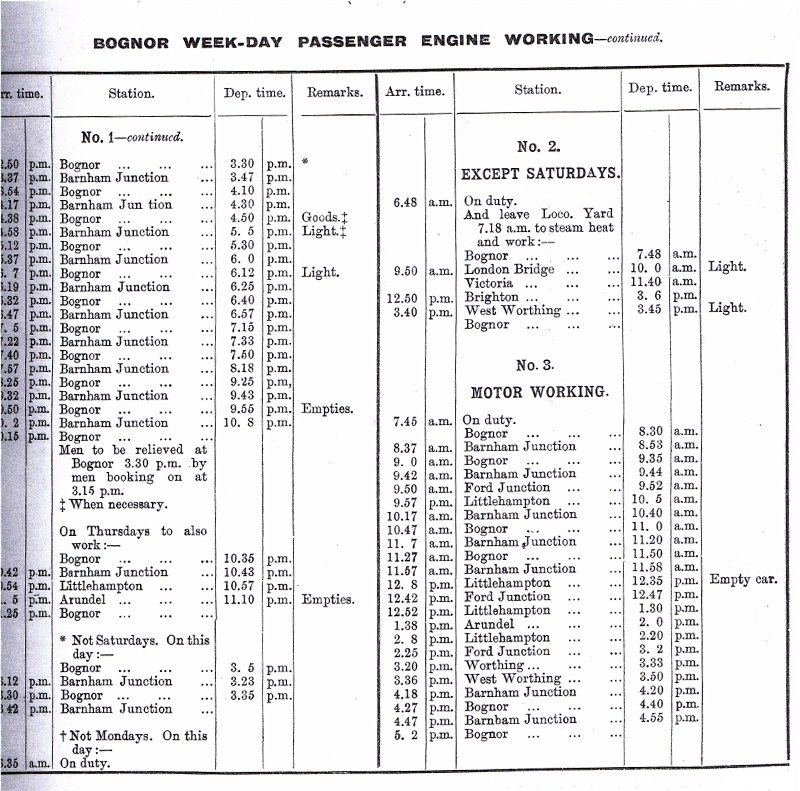 Enginemen working from Bognor looked forward to the “Midhurst Turn”, not least because the booking on time was 8:30 a.m. rather than the usual 3:30 a.m.! The duty was looked upon as a week’s holiday. 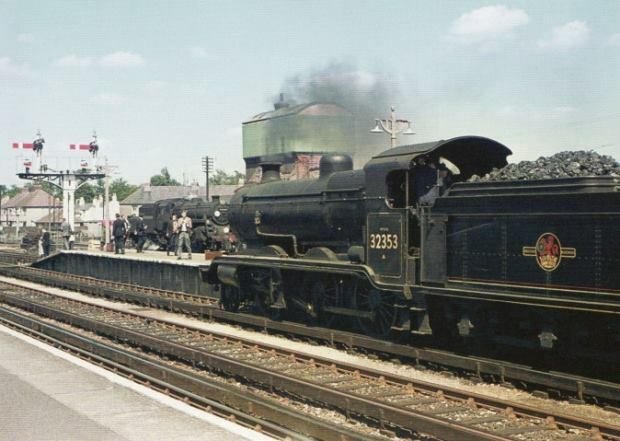 It started each day by taking a light engine – frequently a “Vulcan”, one of the old L.B.S.C.R.’s 0-6-0 tender engines of class “C2x” – to Chichester, where it waited for 15 minutes. 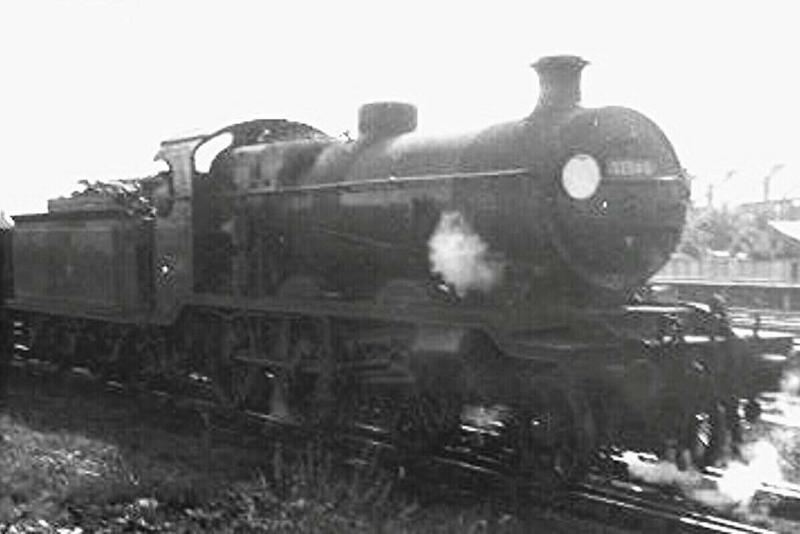 During World War II Chichester had an extensive marshalling yard at which additional sidings had been installed for wartime traffic. Also there was a triangle for turning engines. The site is occupied now by the Westgate Leisure Centre. 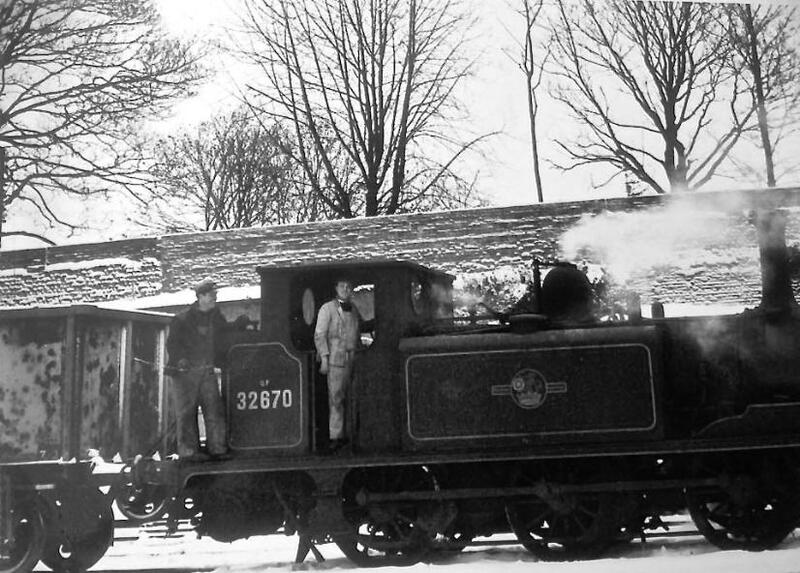 After a quick cup of tea the crew would back the engines on to the goods train for Midhurst which usually comprised box vans with supplies for the village shops, and wagons – some full, others empty for coal yards at Lavant and Singleton. On obtaining the right of way from the yard the train set out, and the signalman in Fishbourne Crossing signal box would be ready, holding out the staff for the fireman to grab as they passed, whereupon the train had a clear path up the line. The climb out of Chichester to the first station of Lavant was on a gradient of 1 in 75 and on the journey care had to be taken, especially with heavy beet trains. In the days when goods trains did not have continuous brakes there were always fears that the wagons might overpower an engine on down grades. George Howes recalled how one driver misjudged his approach and smashed into the Fishbourne Crossing gates which had only been repaired the previous day. The driver had such a fright as thought he might hit a bus on the crossing: he lost all his hair after the accident and it never grew back. 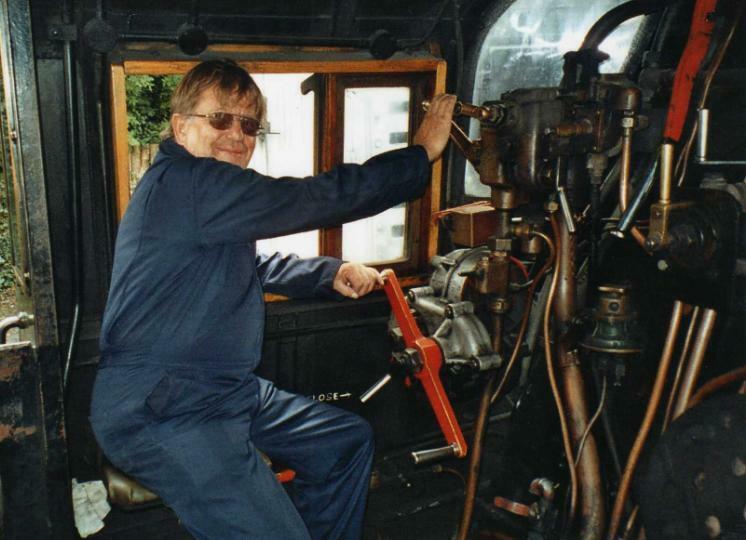 Graham White used to get Freddie Gun, the coalman at Bognor shed, to throw up some extra coal when he was refuelling the engine. As they proceeded past the troops he used to throw out large lumps of coal which the soldiers would retrieve for use in the stoves of their field kitchens. In return, they threw all sorts of items into empty wagons in the train, such as chocolate, tins of corned beef, tinned soup, dried eggs and Canadian cigarettes. Such goodies were in short supply to civilians subject to wartime rationing. At Lavant the spoils were retrieved from the wagons and shared out between enginemen and guard. The American armed forces had a large mess tent on singleton station and likewise gave the crew food such as cheese, butter and bacon which was in far from plentiful supply in the local shops. The platelayer would also present the crew with a rabbit when he had one. That goes some way to explain why work on the Midhurst the line was so popular: nobody wanted to miss their turn! One of the last trains departing Midhurst Turn. 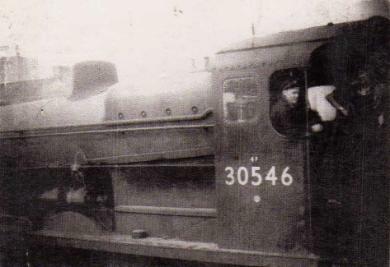 This pastime wasn’t a preserve of the footplate crew as Graham White knew of a guard from Littlehampton who fired a shotgun from his brake van. Graham and the driver used to keep an eye on him, and if he found his target they wound on the brakes. Once allied forces had invaded Europe the line was no longer used for storage of wagons of ammunition and once more trains went through to Midhurst. But the lines attraction for the footplate crews remained. At Christmas time holly and mistletoe would be collected from the line side for use at home and Christmas trees were readily available at Cocking. On arrival at Midhurst at about noon, the train would pull up to the tunnel near the station. The Fireman would jump off the locomotive and go straight into the porter’s hut where a kettle was always on the boil. Billycans were filled and, as the engine chugged back into the goods yard, the fireman would climb aboard the engine. Driver and Fireman would have their meal before shunting the yard. If not much shunting indicated, the crew would stroll down the town, leaving the engine to simmer on its own. On a normal rostered turn the train would make its way to Petworth. Out of Petworth was uphill and the crew would have an n unpleasant time when the engine was working hard with steam and smoke filling the cab. In winter, the crew wouldn’t risk putting their heads out of the cab as icicles might be hanging down from the roof of Midhurst Tunnel. Quite thick at the top, the icicles tapered down, and frequently almost touched the ground. While passing through Midhurst Tunnel, driver and fireman would their breath hoping that the engine would give them little trouble so that their ordeal would be over as soon as possible. It would help if the locomotive was being fired properly and emitting the minimum of smoke. 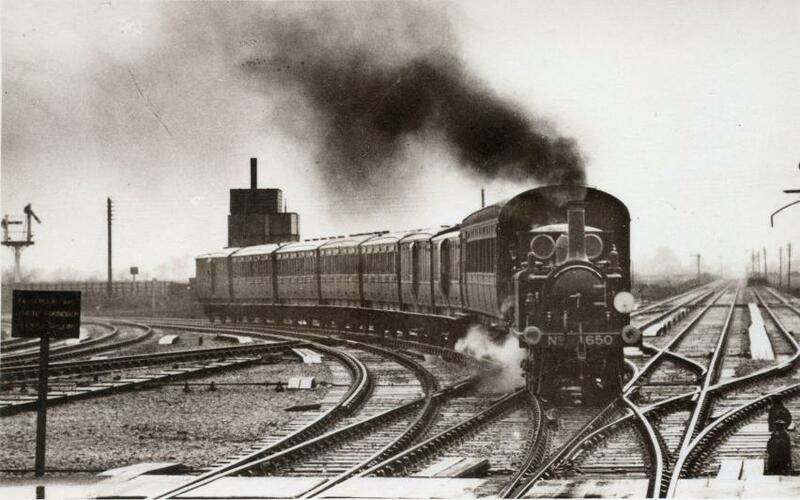 Just after the war George Howes recalled that “smoke-jacks” were out and about, intent on keeping their eye on engines coming up the line, and ready to file a report if they thought that too much smoke was being emitted. On to Selham where the normal routine would take place of trucks being delivered and coupled up. From here loads of chestnut fencing was sent out to Petworth with a passenger service still in operation strict timekeeping had to be observed on this part of the line. 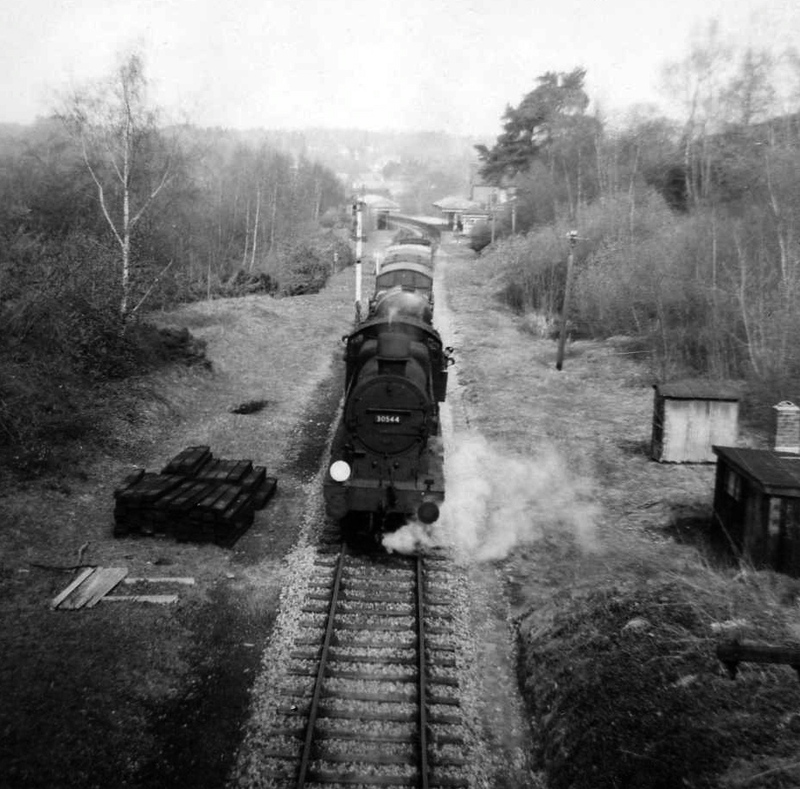 The Chichester to Midhurst turn ceased quite abruptly for Bognor men in 1951, when the engine of the Midhurst goods train met with disaster when a stretch of railway line between Singleton and Midhurst had been washed away. The decision was taken that it was uneconomic to restore the line and thereafter the Chichester to Midhurst goods service ceased. The weather was typical for November in 1951, quite different from today. In the 1950s and early 1960s there would be days, even weeks, during the autumn when it would rain and rain day in, week out. It had been pouring with rain all weekend and was still wet when the crew couple the locomotive to the wagons and pick up the staff at Fishbourne signal box on the start of the journey up the line. On such days, extra unofficial activities such as game shooting were not considered. The main aim was to keep dry. The normal routine of dropping off and pick wagons at Lavant and Singleton was carried out and now came the journey to Midhurst. The engine carried on until the track collapsed under its weight and buried its smokebox in the mud at the bottom of the gully. The tender shot straight up in the air and filled the cab with coal. Subsequently this caught fire and in turn set alight the anthracite coal from the crushed wagon behind the tender. George Howes had landed on level ground and was unhurt but Fred bunker had dropped down the bank, got wet up to his knees and had to hobble up from the bottom. George recalled “It was still very cold and not very nice and we were lucky we got off. If we’d stayed we would both been killed.” The engine had a full head of steam and we were frightened that if it dropped into deeper water then it would have exploded”. The guard, Albert Betterton of Littlehampton also jumped clear and was unhurt. Both driver and fireman walked back up the line to be met by a policeman riding a bike between the track. 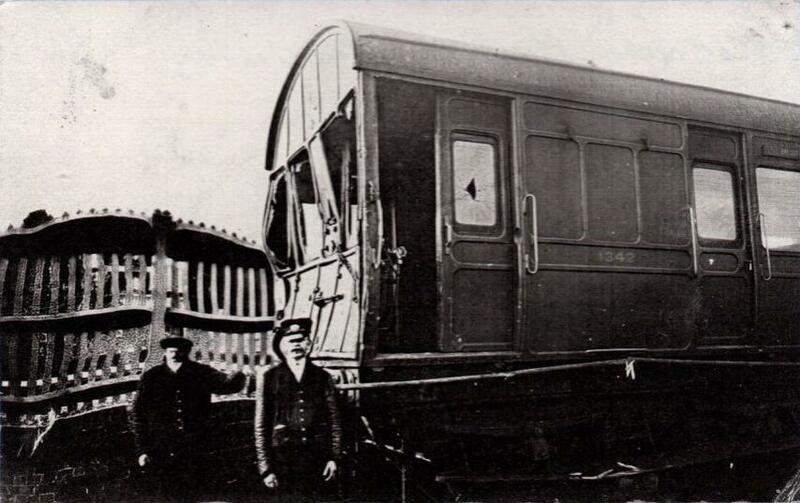 At the Greyhound public house the signalman was telephoned and notified of the accident. It was a very dull and foggy day and the steam from the engine was blowing across the road. As the two men were approaching the station two ladies accosted them and complained bitterly of the noise and the damp, steamy mist. Midhurst and Petworth Fire Brigade turned out in full force and Midhurst Ambulance stood by as there was a distinct possibility of the locomotive exploding. On arrival at the station the crew were soon besieged by reporters, but the crew could not say anything until the matter had been reported to the Railway Inspectorate.The event made local news and the crew had a lucky escape which is personified in the late Fred Bunker as recalled by his fireman “If we’d been killed I would never had my first Christmas with my baby.” Fred had just become a father and it is a reminder that railway work had its dangers in which other unfortunate railwaymen paid with their lives. It seems that the culvert running underneath the bank had been unable to cope with the water which in turn had pushed the bank away. The aftermath of this event was that the coal surrounding the engine kept burning for a couple of weeks. Attempts to recover the engine using a crane failed as every time the crane approached the scene the bank gave way. Eventually, the locomotive was extracted by removing the embankment for several hundred yards and laying a length of track along which the engine, former L.B.S.C.R. Class C2x No. 32522 was winched out. 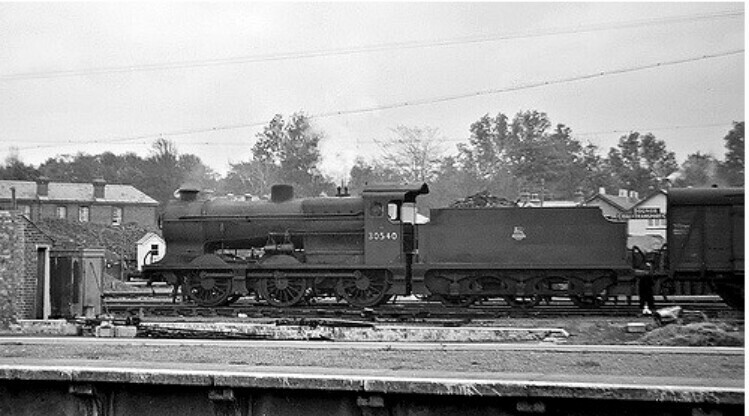 The engine was sent for repair at Brighton in February 1952. George, who subsequently fired on No. 3522, thought it was better than before it had been put down the gully!